THAT'S IT - NO MAS! 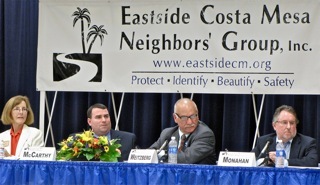 The final Costa Mesa city council candidate forum held Thursday night at the Neighborhood Community Center was a big success. More than 150 people attended for this final chance to see and hear those folks from whom they will select three to fill open council seats on November 6th. Once again, my friends in the Eastside Costa Mesa Neighbors Group did themselves proud. President Jeff McConville kicked things off, then passed the baton to Marnie Primmer, again the moderator for the evening. She conducted the proceedings crisply, kept the candidates on schedule and actually managed to complete the questions and answer portion exactly on schedule. That was an amazing feat when you consider that she asked the candidates 14 questions and they were given one or two minutes to answer each one, depending on the complexity of the question. Not all candidates answered every question. 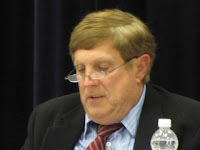 Candidates Steve Mensinger, John Stephens, Al Melone, Sandy Genis, Colin McCarthy, Harold Weitzberg and Gary Monahan were given the opportunity to make opening statements, then fielded questions tossed to them in a random fashion. They were also given two minutes to wrap up. There was no time provided for candidates to rebut responses by others, although some sniping did take place. Generally, though, the candidates conducted themselves with courtesy and respect for the others. Read Bradley Zint's coverage in the Daily Pilot HERE. As you can see, there were questions that should be of interest to every resident, regardless where they live in the city, and a few that might have greater significance to those of us who actually live on the Eastside of Costa Mesa - specifically, the John Wayne Airport Expansion and Recovery Homes. The crowd was respectful, attentive and enthusiastic, but was smaller and not as raucous as the crowd at the recent Feet To The Fire Charter debate. Quite frankly, I suspect the folks who attended the forum last night learned some new information about the candidates as they handled the questions and introduced themselves. It was my impression that most who attended thought it went well. In my opinion, this forum was the best of the bunch again. The hosts clearly spent a lot of times crafting the questions and working on the timing of the evening. In my opinion, and acknowledging my own bias, I think each of the candidates except Al Melone came prepared to answer most of the questions. Mr. Melone clearly has no clue about most important issues facing the city, nor does he have any answers for them. While I understand that it was proper for him to be invited to attend, his presence took up valuable time from the other serious, and prepared, candidates. Of the rest, I think Genis, Stephens and Weitzberg came off as being quite well-prepared. Genis demonstrated her wealth of knowledge and experience about how city government works, including significant detail on some of the more important issues. Stephens clearly had done his homework, too, because many of his answers were among the best. 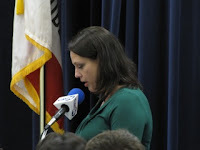 Weitzberg was very comfortable on the dais, fielded the questions without hesitation and offered some creative solutions to the problems posed. Monahan handled the questions the way you'd expect a man who had been on the council for nearly two decades to do. He dodged any hint of responsibility for the problems "created by previous councils" as described by Mensinger at one time during the forum. He sniped at newcomers, which was inappropriate and off-putting. Mensinger came across as an affable guy with time management problems. for example, he was tossed the question about COIN - which he acknowledged was a "softball" - then fumbled it and never did complete his explanation in the time allotted. McCarthy has still not learned that body language on the dais means a lot. When he was not actually participating in an answer he slouched and smirked at the answers of others. Nothing the candidates said or did changed my previous opinions of them, nor will they affect the way I'll be casting my votes. While not televised live, this forum will join the previous others in the rotation on CMTV, Channel 24 (Time Warner Cable) and Channel 99 (ATT U-verse) beginning Tuesday, October 23rd at 7:30 p.m. and October 24th at 5:30 p.m. It will play at least once a day from that date through November 6th, election day. It will also be available for viewing on streaming video at the city web site beginning Wednesday, October 24th. As soon as the actual schedules are available I'll post a separate entry with the times and dates that each of the forums will be shown through November 6th and will include links for the streaming video for each. "..behavior has become part of Righeimer's arsenal of attack tools and certainly demonstrates a certain level of desperation at this late date in the campaign." After the election, regardless of the outcome, we need to get this miscreant off the council. He represents only himself and a handful of ideologues. He will never stop hurting Costa Mesa, even after Monahan, Mensy, and Bever leave to go destroy soup kitchens. We realize that the recall is uphill and hard, but it's worth doing and necessary. Vote the top 3, and NO on V! Boycott realtor Fisler and his agency. Geoff,you are correct , it was a wonderful forum. We already knew how we were going to vote, but this cemented it. Clearly Genis, Stephens and Weitzberg are more intelligent than the rest. Clear, concise answers and a very straight forward approach make them stand heads above (no pun intended) the others. I, was also embarrassed by the behavior.of the 3Ms afterwards. What a pathetic bunch to treat our hosts that way. Although I am sure it will cost them votes with the Eastside group, and elsewhere. Can"t say I am sorry about that. Can't decide who embarrasses the city more, the Mayor or the Mayor Pro-Tem. How these guys ever convinced voters to choose them is beyond this small mind. CLEAN-UP CREWIf the 3Ms are defeated, Righeimer will effectivly be neutered. If he chooses to remain on the council he will not be able to go foreward with any of the agenda that he was placed there for by the OCGOP and he will have to endure being ignored by the rest of the council as they go about repairing the damage he's done. Does anybody think a person of his nature would stay for that? My prediction is with the 3Ms swept away like the dust mites they are, Riggy will huff and puff and... walk. No need for a recall afterall. Does the charter give our council more powers? ABSOLUTELY! I laugh at the 3 M's and their bogus response to this trying to deceptively imply it does not. They keep regurgitating that the charter doesn't give them more powers because it still takes 3 votes of council to pass things. This is so laughable. I think maybe if they don't get elected they could do comedy as MO, MO MO and Monkey. Staying the 3 M's and appearing nightly at Monahan's. They themselves make it very clear this is about more control by taking powers away from the state and giving it too themselves. Who do they think they are fooling with their head fake about this 3 votes nonsense. the issue is not nor never has been about 3 votes. The bottom line is the charter gives council more power as the very heart of the charter is to give them more control and more things they can vote about. Sadly residents have a lot to fear with this council. Then they deceptively say... Well it really gives the voters the power because they elect and trust us to do the right thing. Just remember folks they are trying to force this bad charter on us because they say YOU CAN'T TRUST COUNCILS as they can be bought and paid for. So they say trust us even though you can't trust us. Their entire presentations and comments are based on total contradictions over and over. This council loaded with developers will use every new power they get to their and their friends advantages personally. I would expect them to raise the no bid level to a dollar amount where they can give many contracts to whoever they want. Remember we have to trust them. I think the no bid level dollar amount should be policy set by the voters too! We need protections if we are going to give, these guys especially, or any future councils this much more power. The voters should decide directly if the level should be raised or not. Not 3 members of this especially or any council. Remember folks if council can be bought, as this is the reason for this charter being born in the first place, then developers will be and already are lining up to buy this council. $10,000 from one contractor from Newport to Mensinger already. And what about the CARE Ambulance donations to the M's? Are they not negatively affected by the Fire Chiefs new restructuring plans? What's up with that? I hate to say this but I want Riggy to stay if Stephens, Weitzberg and Genis get elected. I would like him to get a taste of his own medicine the way he has treated others and especially Member Leece who is an outstanding and dedicated Public Servant and human being! Nobody, especially a person of Member Leece's character, deserves what this council and my own GOP party has slung at her. They are truly disgusting. Wow! It sounds like the M's must have been cremated last night. Were they really that upset? I can't wait to watch it on TV. Biased questions usually means they didn't do well. It's funny because I did get to watch the Feet to the Fire Forum and Jack Wu is so biased with his questions yet Stephens didn't cry about it and in fact Stephens used it to his advantage with his answers. That to me shows just another reason to vote 123 for Stephens, Weitzberg and Genis. *LOL* Geoff, you only needed to post one. I couldn't tell if it had gone through or not, so I had to retype it. Sorry about that. I really don’t think Jim Fisler deserves to get dragged into this. Don't arbitrarily mess with this mans livelihood. You forgot to mention that two agents from the EDD showed up and tried to serve a handful of job applications on Fitzy. He immediately ran out of the room yelling that he doesn't need full employment. I wonder if Jimmy Riggy is getting worried about his corrupt friends not making the Council and his B.S. cut and paste charter getting voted down? The stress is starting to show, and Jimmy is worried that all his hard work at taking control of this City is starting to crumble. Don't worry Jimmy there are plenty of other Cities that you can move to and try your hostile take-over again. Mensinger and Monahan win for sure. Genis and McCarthy it will be close. Charter is being outspent but then again the PD and FD outspent the GOP candidates in all elections this century and have a dismall record of success. Interesting the seem to be sitting this out. Oh they want the 3Ms to go down all right but don't think they will and don't want to antagonize them. smart move. "I really don’t think Jim Fisler deserves to get dragged into this." Then urge him to renounce Righeimer and apologize to the people of Costa Mesa for the damage the gang has caused. We shouldn't feed those who hurt us. No listings for Fisler or his agency until he renounces and apologizes. When Gary Monahan decided to throw the President of the United States under the bus last night, I nearly fell out of my seat. He is out of line and his comment has no bearing to his postion as a candidate. UGH!!! Did those big green plastic bags outside the center hold all of Gary's clothes and possessions? Several of the homeless voiced concerns that he wasn't dressed as well as them. Then Bever showed up and took all their stuff to sell in his used goods business. What do you mean by Fisler getting "dragged into this?" He's an officeholder (politician) allied with other politicians (Rigy and Mensy). The inference that he's somehow removed from, and not part of Rigy's destructive politics, is false. Speaking of Bever... he made the LA Times, page 2 no less, yet again. Go Beve, Go! Talk about juvenile bullying, you POS. Be sure to read the 50+ comments, too. If Beve doesn't like my juvenile bullying, he best not click on that link, because it's about 49-1 and not in his favor. Are you telling us that the man who repeatedly whines,cries & sheds tears on television about his children being subjected to political fall out decided to drag his daughter with him to read somebody the riot act? Mayor Pro Tem Jim Righeimer - in a display of inappropriate rudeness normally only seen on elementary school playgrounds - made his way to the front of the room with one of his daughters in tow, found McConville and Primmer, who had been fielding congratulations from others, and "read them the riot act"! He tore into them for what he termed "biased questions" - and just went on and on - perhaps five minutes of vitriol. And in other news...Newport has had a murder, kidnapping (victims beat and released in Kern County) and a bunch of illegals caught trying to enter the harbor by boat. This is all just in the past week. Perhaps they wouldn't have such issues if they could attract better people to the city. Perhaps more people with college degrees. What say you, Riggy? Wow, what a bunch of bitter hypocrites! You whine about the OCGOP's alleged influence while ignoring the shameless big-inion attempt to outright buy the election! They aren't even pretending to be from Cosat Mesa! For Pigheimer to attack the organizers of last night's Eastside Residents Group candidate forum just shows that he is becoming more desperate - he sees what's coming in November. His boorish behavior will only get worse, too. Everyone I spoke with who attended last night's forum thought that it was the best of the bunch. Good questions on a very broad range of topics and well run. Certainly not like the out of control "debate" on Monday! One of the main things that struck me during the opening and closing remarks of the candidates is that none of the Ms said anything about serving the CM citizens, wanting to represent the residents, putting residents' concerns first - absolutely nothing to that effect! Only Genis, Stephens, and Weitzberg mentioned these important aspects of being a cc member. Yet another illustration that the small angry men and baby hughie only have a personal political agenda, driven by another small angry man, and are not the least bit interested in serving and doing what's best for our city and the citizens of CM. Please peddle those Big Lies somewhere else. I'm hearing a lot of anger towards him but don't know what it's about. He's always sided with the 3Ms and the council majority. It was a great forum and the hosts did a fantastic job. Equal time was alloted for all the candidates and the questions were good, not "slanted". Riggy and crew's boorish behavior is inexcusable! That man needs to take responsibility for his actions, something he NEVER does! The fact that Mensinger got involved speaks volumes about him. I hope the voters are watching these childish, bullying tactics used to intimidate the hosts last night. It's outrageous to say the least. Many people saw Riggy berating, name calling, and bullying several of the Eastside Homeowners after the event. Way to “Man up” Riggy. I just hope someone filmed it on their cell phone and/or that CMTV might have caught it. By the way, what sort of parenting model you were for your daughter? I heard the Chest-Bumper/Phony Sheriff Badge flashing/Multiple Sexual Harassment lawsuit defendant himself, Mensinger, yelled “we’re going to look into this” on his way out w/ Fitzpatrick hanging on to his coat tails. The 3M’s are upset because they didn’t do well and the audience was obviously not buying their b.s. You’d think the 2 sitting Council members and the Planning Commissioner would have been the best prepared than others but not so. @ Monahan: You’re lucky no one brought up the fact you refused to show up, as then current Mayor, when your/our city employee committed suicide at City Hall 3 blocks from where you were pulling taps at your bar. If I had had my chance, I would have asked whether or not you are willing to re-negotiate your pension and lifetime medical benefits. Part of taking back our city is to stop funding the people attacking it. If Fisler wants to give his time, money, and support to slime like Riggy, Mensy, and the smirking sloucher Colon, that's his right. But it's our right to not do business with him and help fund the people working against us. Boycott Fisler and his agency until he publicly renounces the Righeimer agenda and apologizes to the people of Costa Mesa for all the damage caused thus far. Despite Napoleon Righeimer's eternal rap about "union thugs," it sounds like the only known thugs in Costa Mesa are he and his fellow gang members. Not one of the Ms last night, in their opening and/or closing statements, said anything at all about wanting to be on the cc to represent the people of CM! Not one of them, not one mention of this. Yet, Stephens, Genis, and Weitzberg made that a central reason for wanting to be on the CC. These are the people We, the People of Costa Mesa, want! And, is it any wonder that the RIGmeister had his daughter witness him attacking members of the Eastside Residents Group - and Harold Weitzberg - after the forum last night? Think back to his "DUI" campaign opportunity! Can hardly wait to hear how he spins this one!!! The current hateful cc union majority thugs are poor role models all the way around!!! 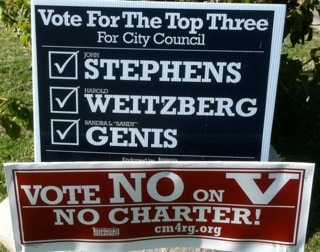 Yes to Stephens, Genis, and Weitzberg and No to V.
We, the People of Costa Mesa, will take back Our City!! Mr. Melone raised an interesting point that might be brought by whoever wins the election, to SCE. White lights can provide better visual acuity, an improved feeling of safety, and reduced energy usage if produced by modern LED technology. Yes, he did. He also made good points about curtailing or eliminating fireworks. Sadly, he was virtually clueless about the other important issues. Hey all, Torelli has a Weitzberg sign out front. I am taking the boycott further: no more using Mesa Water! I will buy my water at the store as long as Fisler is the one delivering Mesa Water. I will show them! Thank you for the answer. I agree with you! Hear, hear! Thanks so much for bringing up the fact that NONE of the 3Ms mentioned representing 'We the People' of Costa Mesa! That's an excellent point I hope all the voters in our city are paying attention to. Riggy berating and harassing the hosts of this forum in front of his young daughter shows how much he cares about what she is exposed to. The boycott against Fisler is only the first of many more to come. You're either for Costa Mesa or for Righeimer's takeover.